You may reach the Settings panel(s) from the Settings menu of the Control Panel . 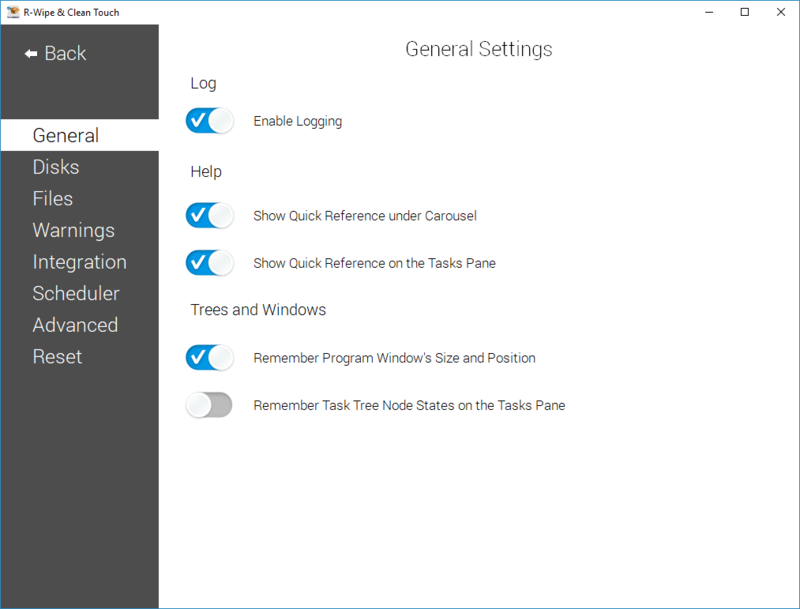 You may set some default settings on how shows some quick references on the Main panel and keeps states of various program windows and task items. 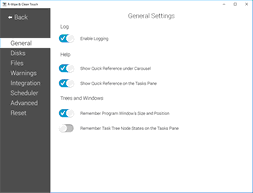 You may set default wiping setting for free drive space on this tab. You may set default wiping setting for separate files on this tab. You may select a default algorithm for wiping files. To learn more about wiping algorithms, go to Wiping Algorithms . 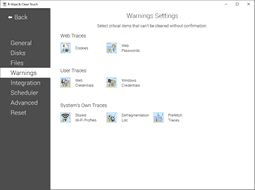 You may specify setting for displaying various warnings on this tab. 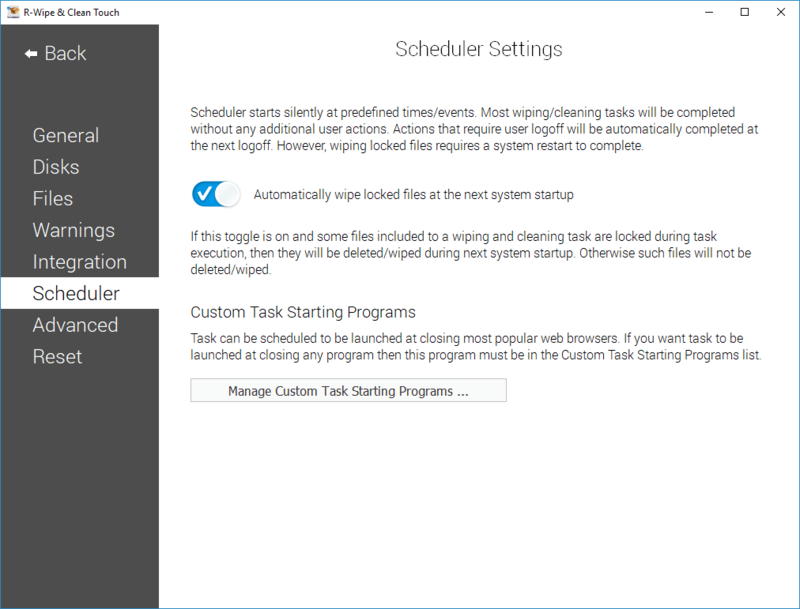 You may set options controlling the integration of R-Wipe & Clean into your system on this tab. 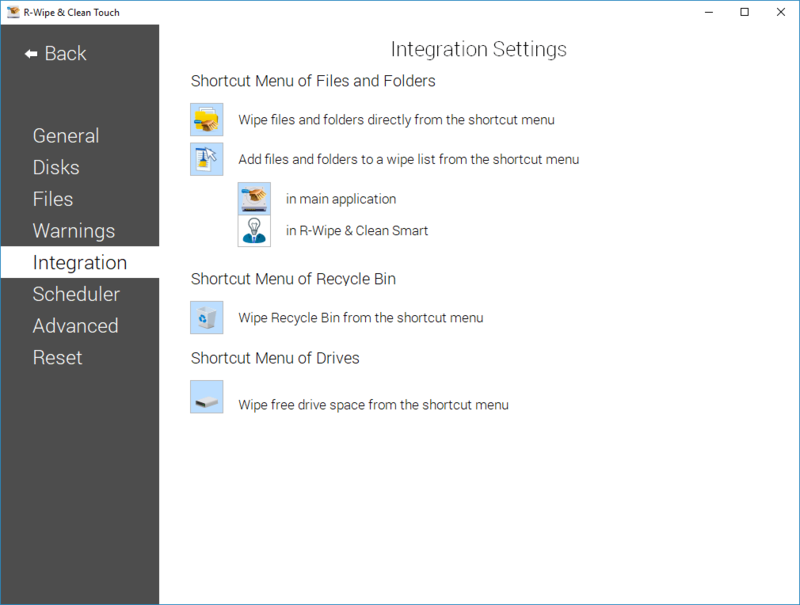 If this option is selected, the Delete and Wipe item will be added to the shortcut menu in Files and Folders. 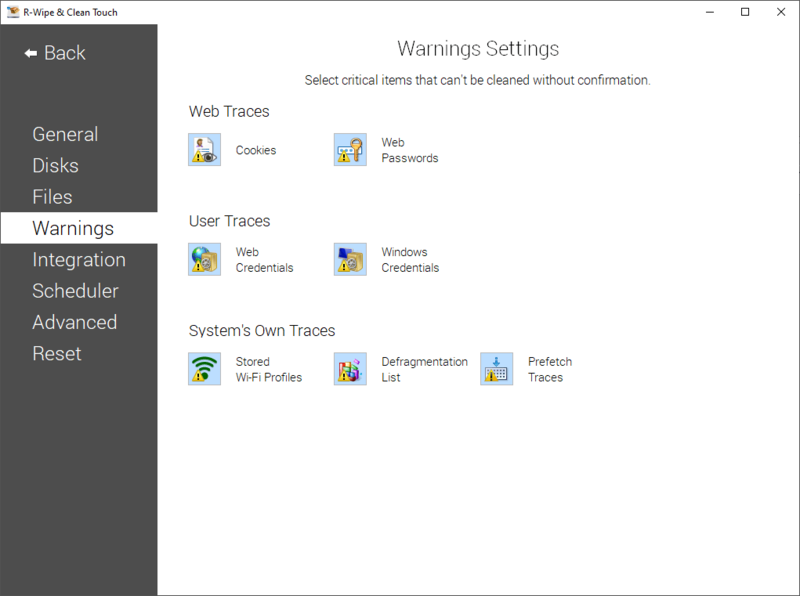 Using this item, you may delete and wipe files and folders directly from Files and Folders. 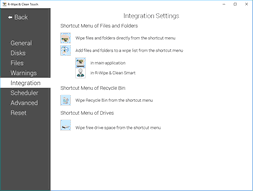 If this option is selected, the Add to the Wipe List item will be added to the shortcut menu in Files and Folders. 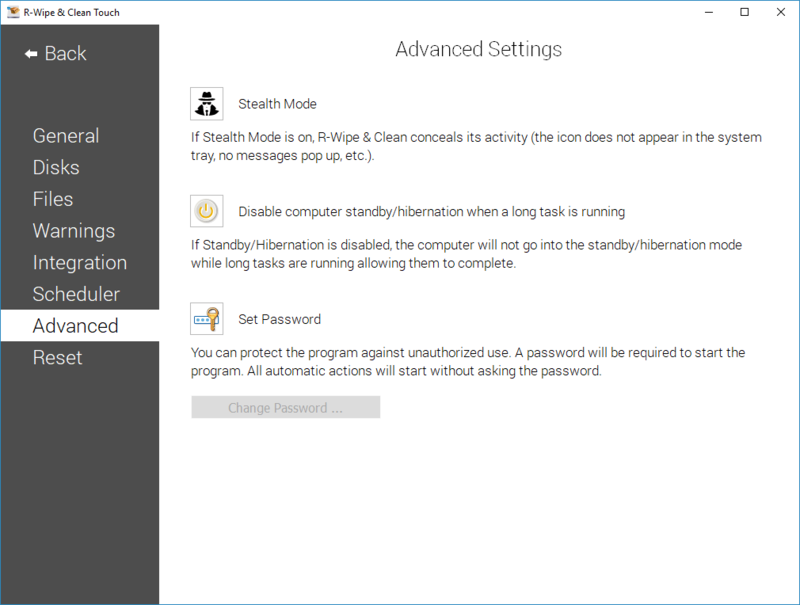 Using this item, you may add files and folders to a wipe list directly from Files and Folders to the R-Wipe & Clean or to R-Wipe & Clean Smart . 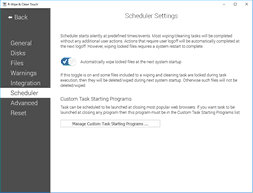 You may set an option controlling the execution of large wipe and clean tasks. 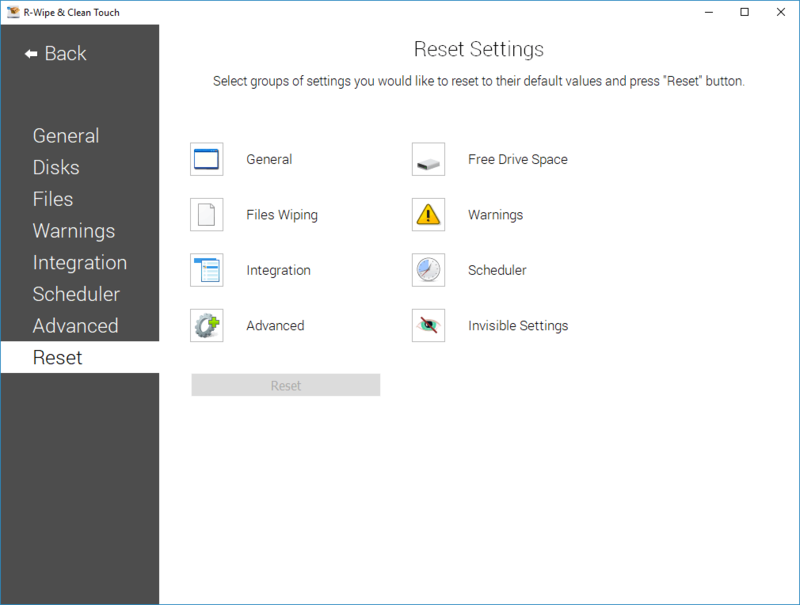 If this option is selected, R-Wipe & Clean will wipe locked files at the next system startup. 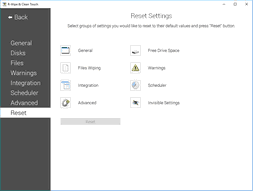 If necessary, you may reset to defaults all or individual settings on the Reset Settings panel.